The airport is located approx. 10 km east of Pribram, by the village of Dlouha Lhota. When driving from Prague, exit the highway at Strakonice (signposted Pribram), then cross the bridge over the highway, and drive along the highway back towards Dlouha Lhota. After 1.5 km pass under the highway and you will be at the airport. 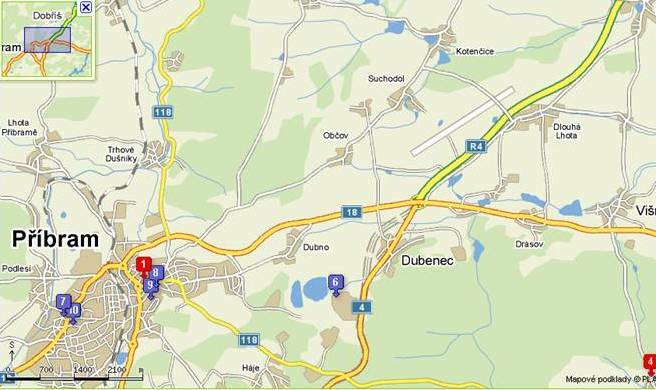 When driving from Strakonice (Pisek), exit the highway at the very beginning in the direction of Pribram. Once you get to the main road, go straight and continue along the highway to a tunnel under the highway leading to the airport. 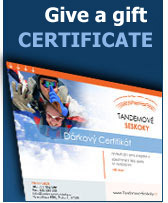 In Příbram, you can tandem jump with us every weekend from April to November. To reserve your jump, we recommend that you contact us 14 days before the intended date. Pribram’s meteorological data on this server are gathered from Kocelovice meteorological station. However, this forecast is a rough guide and you should not fully rely on it. If the weather does not permit jumping (when rain, heavy low clouds or strong winds occur), we will inform you as soon as possible and advise you not to make the journey to the airport. Unless we do so, we recommend that you came. Depending on the weather conditions, the time of your jump may be postponed till later in the day or we can arrange another date after mutual agreement. With your good angel behind my back it was just divine. Cheers, Tomas S.